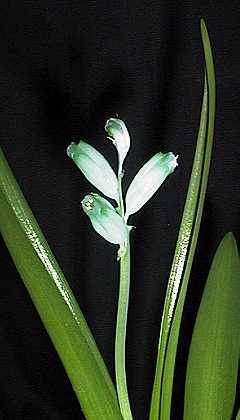 This attractive South African bulb grows and flowers during the Winter, as do most of the genus Lachenalia. This picture was taken on December 20, when this and several others were flowering for the first time since being grown from seed several years ago. The leaves reach maybe up to 25cm, and each flower is maybe 2cm long. Though small, the flowers are a most unusual 'turquoise' colour (difficult to capture on film), and of course give rise to the epithet 'viridiflora' (green-flowered).